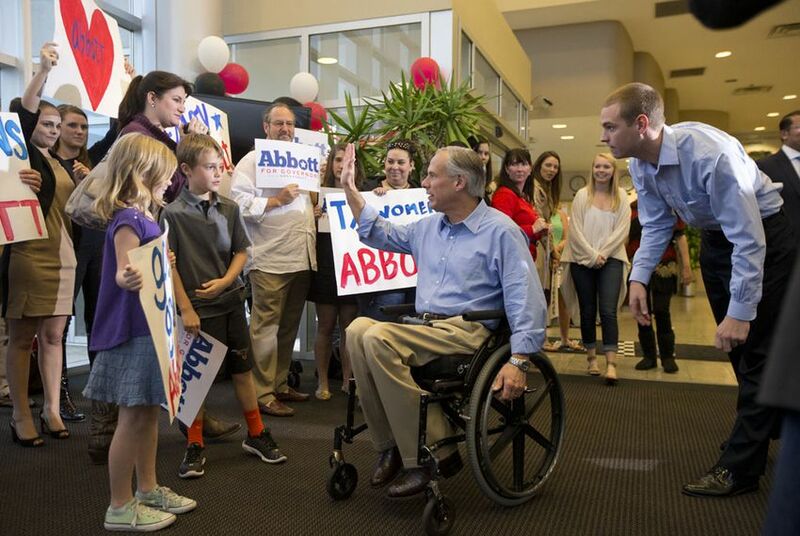 Greg Abbott supporters who dialed into a Monday evening tele-townhall were exhorted to get out the vote on Tuesday, lest Democratic opponent Wendy Davis usher into Texas the evils of liberalism and Barack Obama. On the eve of his probable election as Texas' next governor, Greg Abbott sounded more like a candidate in trouble than an odds-on favorite. Abbott supporters who dialed into a Monday evening tele-townhall were exhorted to get out the vote on Tuesday, lest Democratic opponent Wendy Davis usher into Texas the evils of liberalism and Barack Obama. “We are deeply concerned by the way that we see Barack Obama and the liberal agenda trying to force its way into the state in Texas and hijack this state,” the Republican attorney general told voters during the roughly 90-minute call. "The liberal agenda is turning out their vote across the entire state of Texas. If conservatives, if Republicans stay home and don't go vote, Texas could wind up like California." Later in the call, Abbott told supporters, "If you don't [vote], Barack Obama's liberal, pro-abortion agenda is going to be crammed down on the state of Texas." Earlier in the day, Abbott's campaign sent an email to voters with a subject line that said "Texas Republicans in danger!" "The only thing that can keep Greg Abbott from being elected Governor is Republicans taking this election for granted," the email said. Abbott also attacked Davis for a campaign call she made with Obama and other Democratic leaders earlier Monday, during which Obama said voter apathy could defeat Davis and lieutenant governor candidate Leticia Van de Putte. "Tomorrow voters head to the polls. They’ve got a chance to make their voices heard on jobs, and education and quality health care and all these issues,” Obama said. “I hope these things get you fired up. You should be fired up." Abbott's campaign said just more than 70,000 people dialed in for his tele-townhall on the election's penultimate day. Abbott expressed concern that rain forecast for Tuesday could discourage voters. "If it hasn’t started yet, we’re going to be blessed with some rain here in the state of Texas,” Abbott said. “Do not let that rain keep you from going to go vote. Barack Obama is teaming up with Wendy Davis to turn out the vote tomorrow. We cannot allow Republicans and conservatives to stay home ands think that we got this in the bag." Abbott's call ran the gamut of campaign pledges, including more restrictions on abortion, more money to secure the border, fewer standardized test for schoolchildren and a tough stand on voter ID laws. Abbott’s rhetoric took an extreme turn when he claimed Davis is for abortion "to the very last minute before a child is born.” Davis has said she would support a 20-week abortion ban.